We are a very fortunate, young couple living and working in this amazing village called Huanchaco. Huanchaco has a great mix of Peruvian traditional life and tourism. Great climate, great people, great waves. We have opened a small hostel with yoga studio and we are looking for enthusiastic helpers, receptionists and yoga teachers. We work with 4 or 3 normal volunteers to work in shifts and have a day off after every 2 or 3 days of work. We also need one Spanish speaking receptionist working 3 days a week. Besides that we are always looking for certified yoga teachers who can stay with us for some time and get paid for teaching our classes! Our hostel has good ratings and we currently have 13 nice, spacious rooms and cater to all types of travelers. 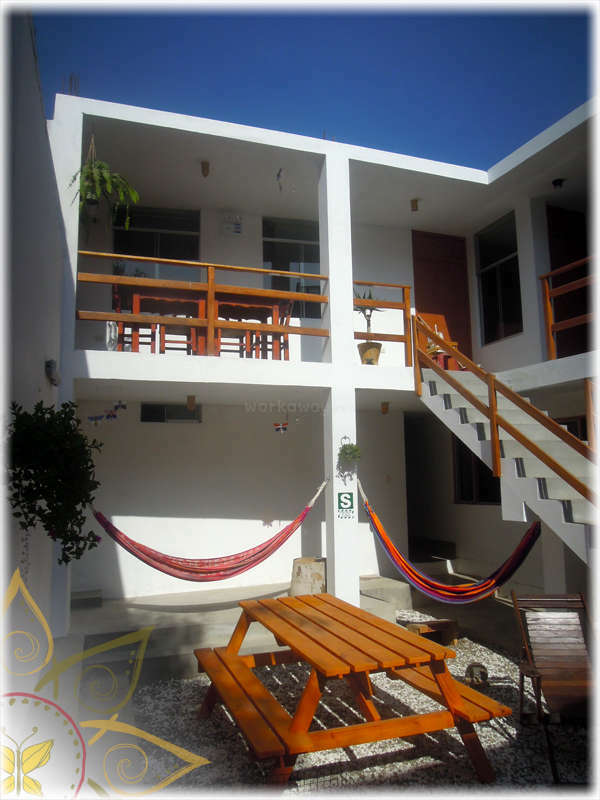 The hostel is in the best part of Huanchaco, just around the corner from all the fun, but in a quiet street where you can sleep well. We are not a party hostel, but we like to call it; 'a hostel for nice people'. : -) The waves will literally put you to sleep. We have a front balcony and roof terrace that overlooks the sea, a sunny garden with 3 bunnies and a big tortoise that walk around completely free! A big living room and the best communal kitchen in town. Dani the owner is a certified yoga teacher, but we always work with foreign teachers to teach classes in English. Volunteers can take the yoga classes for free and the studio is open to use freely. 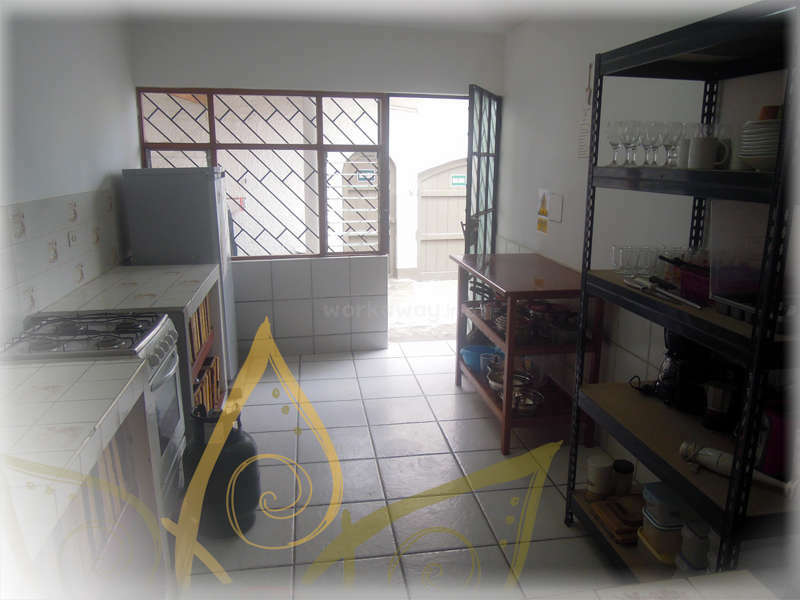 The studio is located on the top floor and has sea view, a bamboo roof, good floor and plenty of space. In Huanchaco you will meet many locals, many tourists and there are plenty of interesting things to do and see in the area. 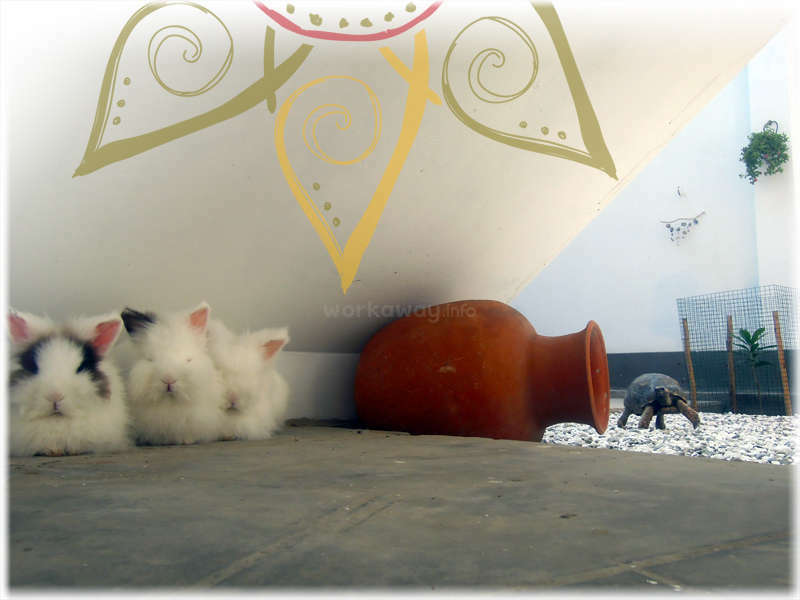 At 'work' you will meet people of all nationalities. We are working with two or three shifts which include little physical work. The volunteers will take turns. In the morning shift you will make coffee, some sweeping and fixing up the shared kitchen, check if things are ok, opening the door for people. Assist to see who is checking out and change the bed sheets in the rooms. Also this volunteer is responsible for whatever emergency may occur in early morning or if the bell rings. If working the afternoon it will be finishing laundries. The receptionist will need to commit to a long stay (at least 1,5 to 2 months). Spanish and English are necessary. You will start with two days of reception Sunday and Monday. A third day, possibly Thursday you will assist reception and it can eventually be a normal reception day as well. You will receive a small weekly payment which should be enough to buy all your groceries, availability of surfboard and wetsuit and joining all yoga classes for free! A great opportunity!! If you are a certified yoga teacher we could offer you to teach with us! We are looking for teachers to teach our classes in English, and stay with us for a while (at least a month). You can earn a decent income, use our surfboards and gain plenty of teaching experience in a comfortable setting! It is also possible to be yoga teacher ánd receptionist! 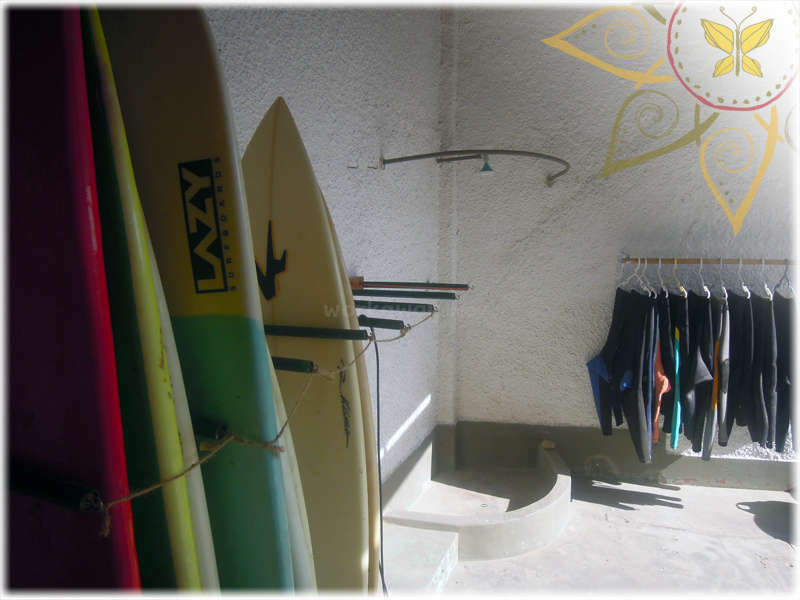 We offer free stay, joining yoga classes for free, ánd free use of surfboards. We are on an amazing location with the sea (and waves) right in front. You will absolutely lóve it here! We have a room with two bunk beds we designate to our 4 workers. This is a private room. The yoga teacher will stay in our best 4-person dorm. Huanchaco is an amazing town with good waves to surf, happy nightlife and very cheap cost of living. And you will be staying in the most beautiful, little hostel in town! There aren’t enough words in the dictionary to describe just how perfect my time was with the family!! No matter what time of year, this will always be a place where you can count on a friendly and loving atmosphere. The guests, volunteers, owners, and animals all make you feel like you are part of one big family and honestly what more could you… read more ask for in a foreign country? The work is super easy and time somehow disappears in this tranquil space. If you love yoga, surfing, or cooking good food with good people, then this is a place where you can really settle down in. The owners were some of the most amazing people I have had the pleasure of meeting and we will be keeping in touch forever! Kaitlyn was a few weeks with us and did great!! She made a great addition to the team. Keeping the spirit and atmosphere really good, taking her work serious and caring about everybody. She has a kind heart and just did really well. Thank you!!! A slice of heaven! This was one of my greatest volunteer experiences yet. I absolutely fell in love with my time at this hostel and all the people I met. Paul is such an amazing and patient person to work with, and I really appreciated the way he treats everyone who helps around the hostel with so much gratitude and respect. I wish I could have… read more stayed so much longer, because it really felt like a home to me. If you are looking for a place to be surrounded by relaxation, delicious food and lovely people from all around the world then I could not recommend this volunteer experience more! Thank you for everything! Ruth is an absolute sweetheart. Just the upmost pleasure to have around and work with. Super kind, happy, interested, responsible and caring. Really does her best which is definitely not something to take for granted when working with Workawayers. She has been with us twice now and always welcome to come back. Big recommendation, she is smart and… read more will pick up any work easily and with care. All the best!! I am sorry, that it took me so long to write the review. Working there was a really good experience. The hostel is very clean, well organized and the location is just great. You can see the ocean from the terasse and you can surf here also as a beginner. The atmosphere is great, very relaxed and you feel at home so fast. Paul and Danny are really… read more kind people and carrying. It has been a pleasure working with them. The work is easy and as described. Paul explains everything very well. I am very thankfull to had the opportunity to stay there, especially as it was kind of last minute. It was hard for me to leave and I hope I can come back soon! Ricardo only worked a short time with us because he got stolen from us by a job offer! ; -) Everybody wants him! haha.. He is a great, great person to have around. Very kind and generous. Also has experience in hospitality and i guess a few other things.. Explaining things is a breeze, picks up things super quick and knows exactly what to do in… read more no time. Good english and spanish, and a very adult approach to his work. We would have offered him a lot more responsibility if he could have stayed! All in all a massive recommendation! All the best and hope to see you again! My stay in Huanchaco was amazing....very welcomed by the others volunteers and the owners are very nice and lovely people. The shifts and work is very well organized, the friendly and healthy atmosphere in the hostel is incredible. Make good friends and shared nice moments. Thanks everybory for this amazing experience. i hope comeback one… read more day. Sami was absolutely fantastic to have around! A super kind dude with a big heart. Nice to all our fellow workers and our guests!! Did his tasks with great care and put in a lot of effort. Very proactively working and really caring about the well being of our complete hostel. Always busy seeing where he could do something. Big recommendation for… read more our friend Sami!!! Good luck with all your adventures and we will miss you! Even if this Workaway was a last minute one for me and that I was initially only supposed to stay for a couple of days in order to visit the archeologic sites around, WAOUH what an amazing experience !! Paul is a very kind gentleman, patient and always sharing nice advices. 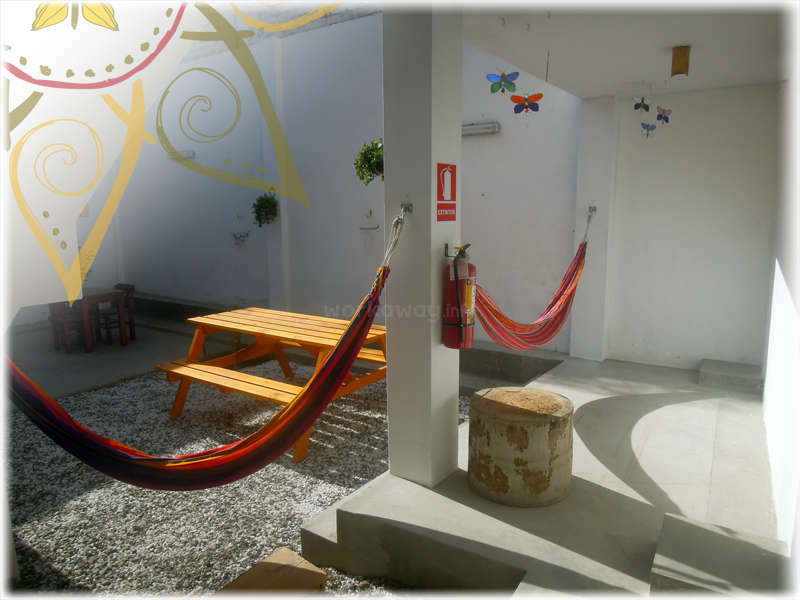 The hostal is incredible and you immediately feel a special atmosphere.… read more Working tasks are easy and varied, but I strongly recommend you to be a fully involved and active person before to ask for volunteering. Paul, thank you so much for having given me the chance to discover such a wonderful place and to make new friends. I'll remember this chapter of my Peruvian adventure for all the rest of my life. All the best and good luck into your father ''mission'' !! Susanne has taught yoga at our school for over a month. At least a class per day! She has done very very well. Classes were popular and people came back a lot for more classes. We got a lot of positive response. She is a kind person with a beautiful inside and outside as well. She had training in hatha, but was super open and smart about… read more changing to the specific needs of our (very diverse) students. We have all kinds of people coming.. young, old, surfers, backpackers, experienced and non experienced so that is not always an easy thing to achieve! She is humble and really wants to take care of people, so took a lot of responsibility to do best. She is calm and easy to follow. So the way she teaches is very comfortable, even when the class is strong! It makes people feel very at ease! All in all a big recommendation. Good luck with your adventures and hope to see you again!! I'd been wanting to go to this project for quite a long time and I'm so happy I was finally able to do that. I was teaching Yoga classes at the hostel for 5 weeks. During the time I gained a really great experience in teaching as it can be a bit challenging at times cause the people attending classes are very different, but I'm really grateful for… read more that! Also speaking Spanish is not mandatory, but definitely helps. I had plenty of time to do my own things, try surfing and cook my own meals. It's a perfect place where to take your time off and enjoy amazing sunsets. But most importantly, thanks to Paul and Dani's wonderful energy, the hostel also attracts many kind volunteers and interesting travellers. I was sad to leave my new friends and chill life behind there. Paul and Dani, I truly wish you all the best and I'm so grateful we kept in touch and you gave me the chance to be part of your tribe for some time. She was with us for a few weeks, or over a month i think. She does totally her best and is very responsible. Always there to help you and watch your back. Thank… read more you so much and come back please!!! James stayed with us for a long time and easily became befriended to everyone. When the opportunity presented to volunteer a while he took it and we worked together for some more weeks! It was very comfortable, James is a nice guy with a great adult approach and very easy to communicate with. He is smart, takes responsibility and is very calm and… read more kind. Very nice to work with, so a big recommendation there. Take care and come back soon!! Pernille was a yoga teacher at our hostel for around a month and she did great! Everybody liked the class a lot and the classes were full. It was also very pleasant to work with her, because she is very sweet and kind. : -) She is a person with a big heart, trying to do well and thinks about the others. Thank you so much for everything and good… read more luck with all your adventures!! Hope you get the chance to teach at many more places and share the yoga. Thanks for giving me the opportunity to teach yoga and experience Huanchaco- it… read more really was a pleasure. Wishing you all the best with the hostel and baby Julian! Wowww the hostel of loveee! This hostel is absolutely amazing! Perfect location, great ambiance, at the minute you get into the place you feel home!! Animals in the garden are fun and the kitchen super inspiring cause big and well equiped and sunny!!! I loved my workaway at Paul’s! Paul is such a nice guy, boss, friend!... He was there to explain… read more the job, the things were clear and simple! The shifts were always easy and then I had lots of time to enjoy the surf and the yoga! Thank you Paul again for this beautiful experience! Rosalie was with us for more than a month i believe. She is a very fun girl who creates a lot of good atmosphere for everyone. But also her heart is massive, she is very sweet and she is doing her best! I feel very lucky to have had her with us. All the best and come back any time! Beth was with us for a few weeks. She did absolutely PERFECT!! She is smart and interested.. picked up everything really fast. She is a very kind, and helpful girl and also mixes with the rest very well. They had great fun all together and she was a positive influence on the atmosphere but also the work ethics. It felt super comfy to leave the… read more place in her hands. Hope you can come back one day Beth!! Take care!! We had the luck to have Theresa with us for over a month!! She is an interested, enthusiastic and very very sweet girl. A total sweetheart. It was really nice to have her with us. She is smart and picks up the things fast. Most important is her kindness, which never fades and which makes it so so nice to work with her! She is very responsible and… read more puts in a great effort. Takes responsibility very well. All in all a big recommendation for her and we hope she can come back one day!!!! This was my first workaway experience and it was really amazing. Paul and Danny are really nice and Paul explained everything very well! He is well organized and it's great to work for him. The work is easy and straightforward. The Atmosphere of the hostel is very relaxed and it quickly felt like home. It is a beautiful and clean hostel. 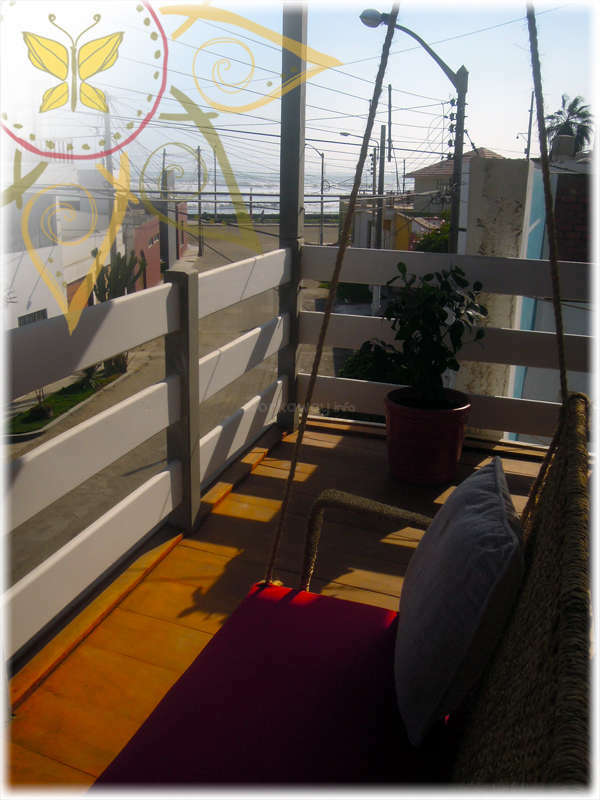 Huanchaco… read more is a small surf town, perfect for beginners and the beach is only 50 meters away. I'm really grateful that I had the opportunity to stay here for 6 weeks. It was a lovely time and I definetly would recommend staying here. Thanks to Paul and Danny for everything. Working there was a really nice experience. The hostel is really clean, well managed and the location is perfect. You can see the ocean from the terasse and hit the surf spots really quick. Paul and Danny are really kind people, genuinely helping and carrying, it has been a real pleasure working with them. The work isn't hard and rotate on every… read more shift, everything is well explain which make it straightforward. I stayed there 6 weeks and never had a dull moment, especially if you like surfing, there is always a swell to catch. Somehow Paul manage to work with interesting volunteers which made my stay even better. I will see you in a few month, thanks for everything ! Loic worked with us for a period of over a month - 6 weeks (?) and might come back to work again. Hopefully that time we can offer him a reception job or something with plenty of responsibility. Loic jumped on the work with full commitment, offering to take as much responsibility as possible, doing all he can to make the best out of it! Gave much… read more more than the average worker we have had, proactively improving things. No need to say he is a smart guy, been around and plenty of experience on work and managing things. Can easily be put anywhere to take full care of any place! If you need for a reliable, smart guy to manage your place i can not recommend more. All the best Loic and come back soon! This hostel is a gem. Paul is wonderful and has everything organized extremely well. The volunteers and guests are a great mix of lovely people- it’s such a relaxing atmosphere that people end up staying much longer than originally planned. I loved taking the free yoga classes, going to the beach, eating ceviche and just chilling at the hostel.… read more The work is simple, outside of making beds in the morning, as long as you promptly do all of the small tasks/ help guests, most shifts are mainly spent enjoying time at the hostel with the other volunteers and guests. I miss everyone already! Ariel worked for more than a month with us! It was great! From the start she has put a lot of effort in her work to do it well and this has never faded. She is a smart and kind person and very responsible! It was very nice to have her around. Being super responsible and always there to help. It is a pity she had to leave. She also was part of a… read more very nice group of workers, who were having a great time together at our hostel. Thank you Ariel and hope you can come back one day! I had a pretty hard time leaving the hostel after volunteering here for about a month and a half. The vibe at the hostel is just perfect; volunteers, guests, and owners are all amazing to work with. A typical day as a volunteer will entail checking in guests, keeping the kitchen clean, making some beds, sweeping the patio, etc. The work is not too… read more tough, but don't get the impression that this is a place to come slack off. It's always very busy and the volunteer on duty will have something to do most of the time. That said, shifts are only 5 hours a day, 3 days on and one day off. This leaves plenty of time to enjoy a great yoga session in the rooftop studio, go for a surf, or whip up some good food in the well-stocked kitchen. I will most definitely be back one day! Thanks Paul and Dani and special shout out to my co-volunteers Thomas, Melanie, Loic, Ariel, and Theresa. You all rock. Alex stayed with us for around one and a half month if i am correct!! That was absolutely wonderful. He is a pleasure to have around. Very adult approach, smart, kind and calm. Picked up all the work easily within no time. Proactive and responsible. It was one of these people where it felt always so comfortable if he was on shift.. because you… read more know all will be in good hands and he will be responsible about anything. Nice person to have around and a good friend. Was part of a nice team of people who were having a great time together and made our lives so much easier. Thank you so much Alex and hope you can come back one day!! Jana has been our yoga teacher for more than a month. This is a massive recommendation for her. Jana is a very very sweet person with a big heart. Passionate about yoga and takes it as her mission to spread it. Studying continuously the theory and putting a lot of effort in setting up her classes and structurizing. People were very happy with her… read more classes!!! She is a talented teacher. Thank you Jana hope you can come back soon!! Saleh worked with us for a few weeks. It was GREAT! He is a very nice guy, good to have around. Very reliable and happy. Great addition to the team and very responsible. Really put in an effort to do the work properly. We had one of our best periods with a great team including Saleh. The hostel did great and people wrote very good reviews. Saleh… read more you can come back any time. Hope you are enjoying your travels!!! Carolin is the best!! She picked up everything so fast and is super interested to know how everything works. She is fun and smart. Only a short time, but got adapted so fast. Felt the securest ever to leave our place in her hands. Very very big recommendation. If you get the chance to have her as a helping hand you will not regret. All the best… read more Carolin and thank you so much for your help!! It was my first time volunteering in a hostel and I must say, it was a great experience! The owners Danni and Paul are just lovely and welcomed me into their little hostel family from day one. The atmosphere is very positive and the work itself is very easy coming with a lot of goodies like awesome yoga classes. Perfect… read more place to slow down a bit and enjoy the surf of Huanchaco. Danno was kind of a hidden gem, but will make his fame on workaway (and the world) quickly... ; -) For any workaway host take this recommendation, Danno is a great great guy to have around. Danno is the kindest guy ever, super sweet and caring for everybody around him. Very easygoing and a positive attitude. Takes the responsibilities with joy,… read more whatever the task is. Super keen to learn all the tasks quickly. When he arrived he was looking along with the others and asking everything so he could do his tasks the right way as soon as possible. This is something you don´t encounter often. On top of that he is smart, and knows a lot about many things. Has a high degree, but is also a certified massage therapist. He seems to be handy with things around the house, like electrics, plants, etc.. Does the jobs with detail, putting in extra effort to stay busy and make improvements if possible. Surely will be a great addition to any team. Thanks Danno, keep in touch and good luck with your adventures. Paul and Dani will always have a place in my heart. I had the great fortune of meeting Dani through yoga in Huanchaco, she gives a very good classes which are both peaceful and rejuvenating. From there I joined them both at the beautiful Hostel just before it opened. I felt like I was part of the family, they are both very welcoming hosts. Working… read more with them was a pleasure and they have created an incredible chilled and beautiful Hostel. I loved that they had bunnies and tortoises as well! Great place, can't recommend it enough. Dani and Paul, I wish you all the best and much love. Helen stayed with us over a period of a couple of months! She helped us building and decorating our new hostel, staying with us as a member of our family. Then she supported us when getting it opened and worked a while as the very first volunteer while functioning. She became a good friend and supported us on all aspects along the last hard… read more months to get our hostel opened. She has helped us with construction (painting and stuff..), decorating and later helping our guests and maintenance. On top of that she has helped us with making photos videos and setting up social media! Helen is creative.. made decorations all by herself, also with recycled goods. She is handy.. painted and built things from wood. She is knowledgeable about technology and social media.. made pictures, videos for our instagram and set it up. She also knows about websites and other internet stuff. She is also very social and caring.. she took great care of all our guests and made people feel at home. Helen is a very kind and warm person and makes everybody feel comfortable and is preoccupied about others' well-being. She always helped and cared for us. She does the work as good as she can and looks where she can be of any assistance. She is very smart, knows a lot about many things and does things well and carefully. She is professional ,responsible and pro-active. She communicates very well with people and is sophisticated. Surely she will do well in anything she gets involved in! Oh boy, I can't say enough positive things about this experience and how grateful I am to have had such a grounding time. I came to Peru to hone in on my teaching skills, to learn more about myself and to grow as a teacher. I taught yoga for over a month, all the while volunteering at the front desk- it was a perfect opportunity to reflect,… read more enjoy and take a step back from modern life, rediscover myself, improve my spanish and CHILL OUT! The work is fun and easy going- the hostel attracts a wide variety of humans from all over, and being a yoga hostel there is a shared interest in health and wellness- NOT a crazy party vibe which I LOVED! There is always a vegetarian meal being prepared in the kitchen, and people going in and out for a surf! Also the home-made peanut butter was ON POINT! It doesn´t happen very often i get that sad when someone leaves. It has been a blessing to get the opportunity to meet you and have you with us. You have done all the volunteer tasks, taught yoga and worked as a receptionist. So you surely were very important to us. Patricia is so kind, so nice. A smart girl, taking her tasks… read more serious, super reliable and treating our guests well. It was a joy to finally work with someone of my age, the adult approach but at the same time being a great addition to the team with the kids. ; -) I think the vibe we had the last weeks was one of the best ever. It was so fun to see you all together!! You have done great in all tasks, worked reception without a problem and people liked your yoga classes. Lucky those who get to work with you in the future! So yes, this is a massive recommendation!!! Good luck on your travels. Hope you find nice places but still feel the need to come back here. haha. We will wait for you. My experience volunteering at the hostel was been really really great. Paul and Dani are great hosts: very nice, caring, warm and working with them is easy and flowing. I felt very respected and value by them. The tasks are easy and enjoyable. The hostel is beautiful and confortable. The atmosphere is very good vibes between guests, staff,… read more owners. We had also some nice communal dinners together. I'm sincerely grateful for this experience and the time there. And I could say more good things...!! It was great having Bethania over. She is a really great addition to the atmoshpere as she is fun and kind. : -) She does her best and is proactive!! She has a very warm heart and positive spirit. She is doing a great job going around the world spreading happiness and joy. I very much recommend her to anyone looking for a great positive mentality… read more on the job and in a team!! Thank you ! my passage through atma was one of the best experiences of my trip in terms of work and living is a place more than special, I think the secret of that incredible vibe is that Paul and Dani make a space in which both volunteers and guests We felt at home .... so when you felt confortable you work happy and I was lucky to be part of the… read more best team ever ... just if you have the opportunity to visit this place in any way or for as long as you can just do it .. the family of rabbits, Dondoco and Fidel are part of the magic of the place! gracias a todos ! Rachael has done extremely well as a yoga teacher for us. The classes have never attracted that much people! : -) She is a sweet teacher who gives a very very enjoying class for everyone. She is very very sweet, and is nice to work with. She has really done her best to… read more do everything as good as she can. She was very proactive and caring for our place. You can come back any time, just drop me a message and we would love to have you! All the best on your adventures! Mágico! More than happy (and lucky) to call this my first workaway-expierence!! I spend nearly 3 weeks there and enjoyed every single bit. I'm so grateful to have met such incredible people like Paul and Dani (including the whole crew) -such beautiful souls! Thank you for everything!! It was a very enriching experience. Never felt that much… read more comfort and warmth in such a short time before. I really enjoyed the balance between to work and not to work. It was pretty well managed and not hard at all. It is everything you can wish for! Thomas stayed with us for 2 months! It was very very sad to have to say goodbye to him. Thomas is a great guy to have around, a super good worker and very reliable. Where can i start? Thomas became a good friend and one of our main workers. He has always done his work as good as he could. He was fun to our guests to have around and we could… read more always count on him for anything. He has an adult approach and takes his responsibilites serious. At the same time he is social and has a great time with everybody. A very, very kind personality. Thomas also ran some acro yoga classes which were booked full every time. I heard he was a great teacher. Hope you can come back one day Thomas! All the best! I spent 2 months working in this beautiful hostel and wish I didn't have to leave. In this hostel I found great balance with surfing, working, being able to cook healthy meals and teaching Acroyoga. I really felt apart of the family and couldn't be more grateful to share this experience with Paul and the rest of the awesome volunteers. The guests… read more who stay at this hostel are all super friendly and due to the small size, it makes a nice atmosphere. 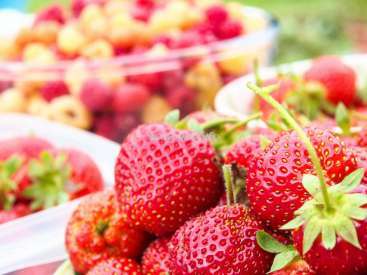 Paul has everything really well organized and the work required is straightforward. It's a great feeling being able to help out such a beautiful family. I stayed here for about one month. I really enjoyed the time there. 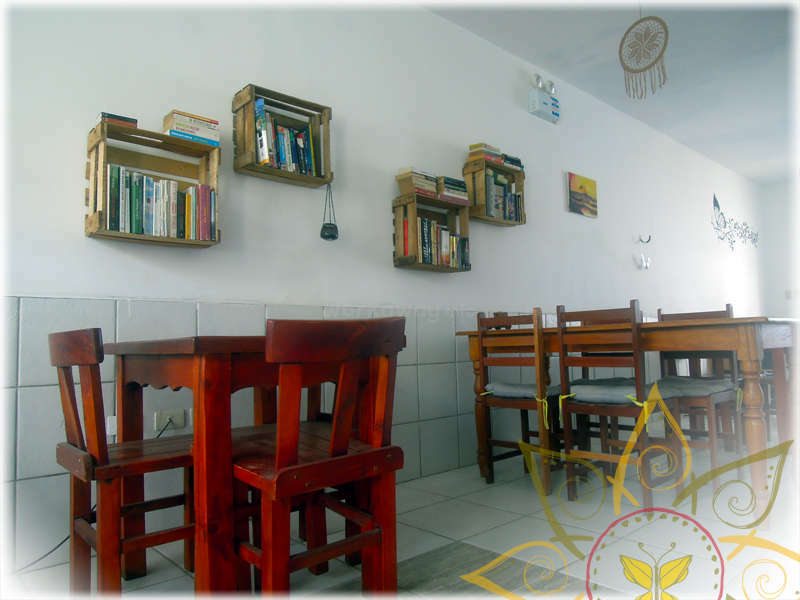 You can pass your free time in this wonderful Hostel, in which you can feel like home. There is a nice sleepingroom… read more for the volunteers, a very good equipped kitchen and several possibilities to hang around. Aside from that you can go to the beach, that is very close, a café nearby walk a little bit through Huanchaco or visit Trujillo after a short busride. Boshra stayed with us for about a month i believe. She is such a wonderful person! She is calm, friendly and smart. It was very comfortable to know she was there when i was gone. Easygoing and understands everything quick!! This is a bit of late review, but wanted to update on my wonderful experience here. I only had the opportunity to work in Huanchaco and at the hostel for a week, but it was a very grounding and wholesome time that allowed for much growth and inspiration. I taught a few yoga classes with the support of Paul and Dani, and had felt at ease and myself… read more teaching in this very relaxed and comforting studio.the studio is very well maintained, nicely lit, and with. windows where you can hear the breezes from the sea, and view the colorful and calming sunsets. The hostel environment is filled with love, connectivity, and very good energy. The decoration and amibece was done with such care and purpose. The owners and volunteers help you to feel apart of the local scene, integrate with the community, and come back to a place to feel safe and nourished after a day of surfing, or other explorations. It definitely draws in a very positive group of people, with whom you can share stories, laughters, and meals with! The work of the hostel schedule is very organized, and independent with of course help from other volunteers and Paul whenever needed. I felt super supported being there and always someone to help guide me if needed. Working in the hostel was a great insight on how to run a very open respectful , and successful business. Thank you for having me and hope to be back one day !! Working here was an experience Brian and I will never forget. We fell in love with this place and Huanchaco, and we ended up extending our stay for two full months of volunteering and enjoying life in this beachside paradise. Paul runs the hostel and Dani manages the yoga. We could really tell that Paul and Dani care about maintaining a high… read more standard for the hostel and it's guests, as well as the volunteers, and it was a pleasure to work with such a sweet and caring couple (and baby Julian!). We dream of opening our own hostel someday in the future, so working here was a great opportunity for us to learn how a well managed hostel operates on a day to day basis. This is a quiet laid-back hostel, where most guests like to cook their own food (in the amazing kitchen which we already miss! ), practice yoga, surf, and hangout in one of the large common areas. The hostel tends to attract people with good vibes, and we ended up making many new friends. The hostel is really clean and well-designed. It is located slightly farther from where most of the other hostels are grouped together by the pier, but Huanchaco is so small this is not a problem. This also means the hostel is more quiet. The hostel cat, Fidel (we suggest to change the name to Fidel Catro), was a cool kitty. The volunteer work is well organized with clear instructions, and the work is relatively easy. There are some busy mornings, if there are a lot of checkouts, but honestly it makes the shift go by much faster. Volunteers work 3 days in a row, followed by a day off, and each rotating shift lasts 5 hours. Because of the shift rotation, your last day finishes with a morning shift, then have the rest of the day off, you then have the next day off, and you don't start the next work day shift until 5:30p in the evening, so it almost feels like having 2 full days off. Every volunteer we worked with appreciated that the shifts were rotated in this manner, and we were allowed to trade shifts with fellow volunteers if needed. Volunteers get to take free yoga classes, and can use the volunteer surf boards (4 boards) and wetsuits (3 suits). Paul maintains updated volunteer instructions, and has a weekly schedule with daily checklist to guide volunteers. There is a Whatapp group amongst the volunteers and Paul and Dani, so everyone can communicate any issues, ideas, or just joke around. Paul and Dani constructed this hostel themselves, and it is clear that they really care about it. Paul is a good communicator, and his Dutch directness is a real advantage when working with volunteers from different nationalities. Paul and Dani are open to suggestions or recommendations you might have based on your observations as a volunteer. Usually one of the volunteers is also the yoga teacher. The yoga teacher/volunteers got to gain experience teaching yoga, while receiving a share of the revenue from their classes. We had a unique opportunity to help manage the hostel for Paul and Dani, while they traveled for a week with their parents and new born child, Julian, to Lima. 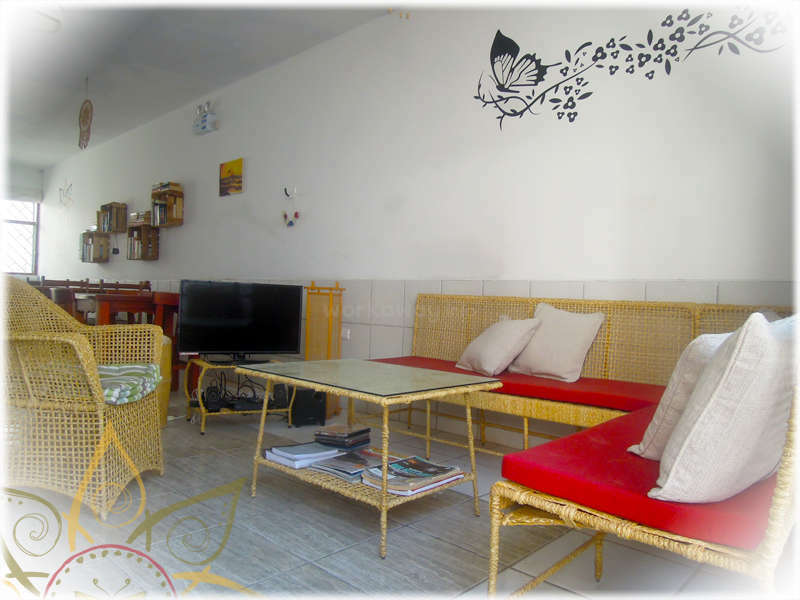 They put their trust in us, and we got the valuable experience of running a highly rated and successful hostel. Thank you so much Paul and Dani (and Julian) for all of the great memories and the trust you've put in us! It was an honor to work for such sincere and honest people and we hope to meet you again someday! Alanda and Brian have worked in our hostel for about a month if i am right. They have worked as regular volunteers but also took full responsibility of the hostel management when we were away for a holiday. When they stayed with us first and offered to work i just wanted to find a way. They are a lovely lovely couple. It became apparent soon that… read more leaving the hostel to them during our holiday would be the perfect solution. They did great and we could really enjoy our time away. They have taken care of the complete administration and billing, making sure everything went smooth. And they did a perfect job. Brian and Alanda are a very nice couple. Both fun to hang out with and carry great responsability. They bring a positive vibe into the hostel. They just got a very adult attitude. Calm and interested, wanting to do well and show care for the hostel, but also to us as people and friends. Picking up things quickly and try to do everything as good as they can. Alanda is just a very hard worker. Wants to do absolutely as good as she can. Thinks about the smallest details and works with very much detail and care. Brian is a very peaceful factor, calm and smart, and also very proactively seeking where to be of more help. Recommend these guys by all means. They will be a great addition to any hostel or other place!! Take care and hope to see you again one day!! My stay with Paul and Dani and everyone else there was amazing. Very nice people and nice location, cozy hostel. 2 weeks I stayed there came by really fast and I was really thankful for the opportunity they gave me. I felt very welcome. Yoga classes are really good. I would recommend them 100%. Hale is a great person with an amazing story. She is very sweet and kind and works very well. She will put a mature attitude in her work, but has great enthusiasm. Very very big recommendation for her!! All the best to you Hale and thank you for helping us in this important time in our life. I am extremely grateful to Dani and Paul for giving me the chance to teach in their beautiful yoga studio when I was a fresh 200hr teacher training graduate. They let me free to express and also to introduce meditation classes and to give thai massage to guests. I’ve worked in the hostel as well, which is a 4h per day easy task, in exchange for a… read more very cozy accommodation. During my month and a half stay, I made some very good friends that i’ve found between volunteers, guests and local people, and this is because the hostel is really homey, the yoga studio is the best and the only proper one in Huanchaco attended by local people as well, therefore community and friendship grow spontaneously and easily. Thank you Paul and Dani for sharing your love and care and passion with me. What a great hostel, filled with such brilliant people for my first workaway-experience! Paul and Dani are incredible: Very caring for everyone around them, always hard-working, just good to be around. I received some bad news from home while being at their place and especially Paul went out of his way to make me feel better, to cheer me up and to… read more make me feel "home-far-away-from-home". Thank you guys so so so much for this! I stayed at the hostel for about 6 weeks, usually working shifts of 4 hours a day which are just easily doable: It was mainly making beds, folding sheets, keeping common areas clean, helping out guests with whatever they might need and just doing whatever seems important at the moment. Many guests at this hostel are extremely relaxed and laid-back and it does happen quite often that people extend their stay due to the good atmosphere and the cosiness that Paul and Dani created. Either saturday or sunday was off, while two of us three volunteers managed the place by ourselves every sunday to let Paul and Dani have a well-deserved day off, too. If you enjoy working in a relaxed hostel, staying in a small yet touristy town, going surfing (I think especially if you know how to surf a bit already), meeting interesting people from all over the world or if you're a yoga/pilates-enthousiast - it is a great place to stay and just be happy! I spent a little over a month at here and had an amazing time. This was my first Workaway experience and I couldn't have asked for a better start. I taught yoga every morning and then helped out with one of three shifts during the day. The work was very relaxed and most of the time a lot of fun. The most "work" you'll do is changing bed sheets and… read more doing laundry. Easy stuff! This was the most comfortable and friendly hostel I've been to in Peru and the people who come here are very chill and nice! Paul and Dani are such nice people and very hard working, and really appreciate the help you are giving as a volunteer. I can recommend anyone to come here, either as a volunteer or as a guest! Tobi stayed with us for about a month as a volunteer worker and yoga teacher. It was absolutely amazing to have him with us! Tobi is a great guy. Really fun, easy-going and with a very positive attitude. A big relief to have him around. You know all will be great since the moment you see him! : -) He is smart, works well and is not too shy… read more either. He can suggest improvements and deal with any kind of problems if they present themselves. He is a responsible guy and a good friend to have around. Tobi worked as a yoga teacher with us. We highly recommend him as a teacher. He adjusted very well to the level of our students and everyone absolutely loved the classes. We are available as a reference for anyone who wants to know about his teaching!! All the best to you Tobi.. wish you could stay forever. She… read more has an amazing personality and was fun to have around. She is a great addition to the family, doesn't party too much at all, but talks with enthusiasm to the others. I can't recommend her highly enough. She can tackle any kind of workaway job to perfection i am sure. Really, it doesn't get much better than this. Thank you so much Myrthe and hope you come back one day. You are always welcome here! This was my first workaway experience and I loved it! Paul and Dani are just lovely and made me feel very welcome. The work is easy and only 4 hours a day. They expect you to give your best but in your free time you can do whatever you want. 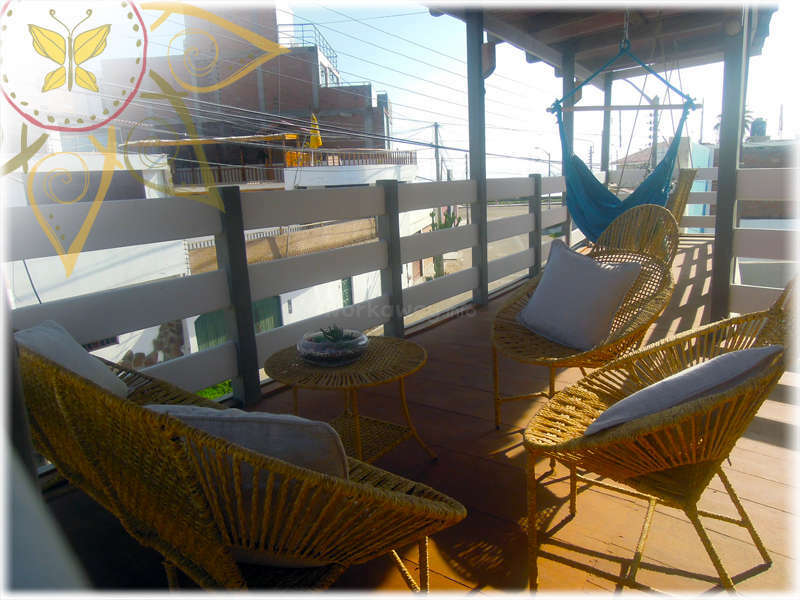 Huanchaco is perfect if you want to improve your surfing, but the hostel is also a perfect environment if… read more you just want to relax and do yoga or do nothing at all. I'm sure everyone will have a great time here. Thanks again Paul and Dani! Dani and Paul have built a beautiful house and hostel, where we felt welcomed from the very first moment. 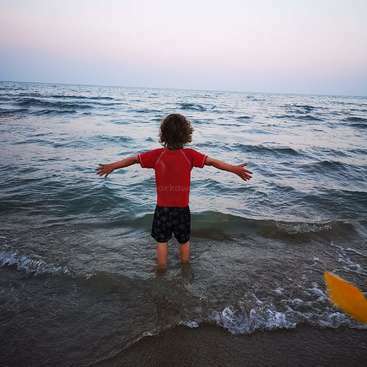 The hostel is only 50 metres from the beach, it is big and never felt crowded. 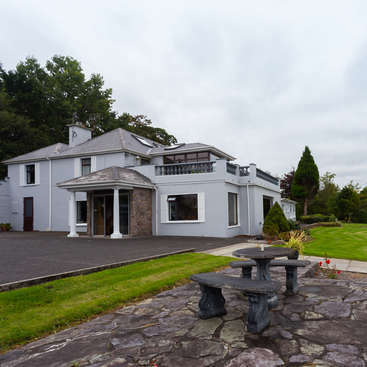 There's everything a traveller needs here: fully equipped kitchen, yoga classes (and a big yoga room you can use in your spare time), and many areas to chill out… read more and relax. 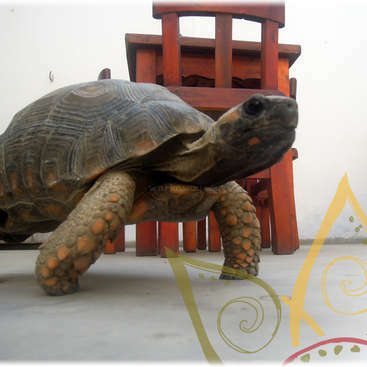 They have some nice and quiet pets (rabbits and tortoises) and they themselves are really warm and kind people, who are great to hang out and work with. On addition, Dani's yoga classes are part of the life here and they were great to start off the day. She is a great teacher and we really enjoyed her classes and company. Paul is very responsible and always wants to make sure we are comfortable and having a good time, giving tips of things to do and how to get anywhere. 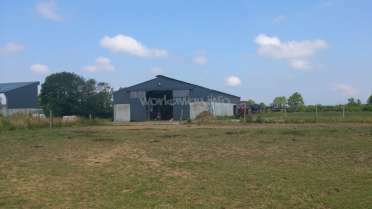 The work is not hard at all and we really enjoyed doing it and helping as much as we could. The balance between work and life was perfect, we couldn't have found a better place to volunteer! Guillermo and Alice stayed with us for two weeks and we had a great time together. Guillermo is a super nice guy, sharp and helpful and takes good responsibility. Alice is a sweetheart, takes good care of people and is really pleasant to have around. Both offered to help out and asked in which way they could be of more assistance. It was super… read more comfortable having Alice and Guille here as our friends who were there for us to help out! They are completely responsible and do their work well. Hope to stay in touch and all the best to both of you! So the description perfectly fits to what you can expect. This is the real workaday-vibe that one could wish for as Dani and Paul are so genuine, humble, warmhearted, open-minded people. Their hostel felt a home to me right from the start when Paul answered my request. He was helpful in every way to make your own stay also a place to enjoy your travels even if it includes working. Paul and Dani really want their hostel to be working and take every feedback seriously to make their guests comfortable - as with us volunteers. I am happy to have found friends in Huanchaco and if you get the chance to work here than you are definitely a lucky one. Thank you so so much for the experience, Paul and Dani because it truly was one experience that I will later tell my grandchildren about. As if you think life just couldn't get any better and being surrounded by the most beautiful people ever... Linh showed up! She is a little girl with a big heart.. Smart and kind and a good worker. She also taught some yoga classes here and exceeded our expectations. Good job! She quickly became a friend and assisted us in any way she could.. Did… read more the work very well and detailed. She is smart and picks up things quick. She is calm and serious, but nice and social. She was there for us when we needed extra help or in emergencies and really cared about doing her work well and taking care of our place. Thank you so much Linh and all the best to you! We were the fortunate people to have Giacomo working with us in our hostel for some weeks. Giacomo is one of the nicest dudes i have ever met to be honest. He is so caring and respectful and nice to have around. Giacomo has become a friend and anywhere he goes i am sure he will be a great addition. Thanks and hope to stay in touch and see us again one day. I volunteered at the hostel for a little bit more than two weeks but I wish I could have stayed longer because the place that Paul and Dani have created is very special. They are very compassionate, friendly and helpful people. The atmosphere at the hostel is really unique. The work is easy and Paul is always there making sure that volunteers as… read more much as guests are having a great time. If you are lucky enough to find a free slot of time to volunteer here, you will have an amazing experience. Thanks Paul and thanks Dani for your kindness and your amazing yoga classes!! Edith was with us for around two weeks. We wished she could have stayed longer. She is a very sweet, helpful girl.. cheerful and caring.. She is smart and speaks english and spanish well. Always there to help and offered us to stick around so we could have some time off from work. That's special!! She is very responsible and has experience in… read more different fields of work so she can take on easily management functions. Highly recommend her for any workaway. Hope to see her again soon. I feel so thankful and blessed to have been able to volunteer at this beautiful hostel, and Paul and Dani were the most amazing hosts. I showed up just thinking I would stay a few weeks and ended up there for 4 months.. it was way too good to leave! The work was easy (receiving guests and a small amount of cleaning), the hostel quickly became like… read more home with a great relaxed, family style vibe and it was so great working for Paul. He is very hardworking, organised, fair, friendly, approachable, easygoing and fun to be around, and you can really tell that he cares about his volunteers and well as the guests of the hostel. He is open to suggestions and always goes above and beyond to help people with whatever he can; nothing is ever too much trouble for him. Paul and his wife Dani quickly became friends; they are so welcoming, kind, generous, joyful and easygoing.. it was so great hanging out with them during my time there. I would absolutely recommend volunteering for them, I couldn't imagine better people to work for! Also, Huanchaco is an amazing place.. I really fell in love with it and could have stayed there a lot longer! It has great, consistent, uncrowded surfing, friendly people, incredible sunsets, lots of groups/projects/activities to get involved in if you want and the surrounding area is full of interesting ruins and beautiful places to visit too. If you come to Huanchaco and volunteer for Paul and Dani you won't want to leave! Thanks so much for everything guys! Shannon worked with us for almost 4 months!! She is like an angel, always shining and laughing. I was desperately looking for a volunteer and was so happy she responded. When i opened the door i knew straight away this was one to keep as long as possible. She has a kindness that never fades and keeps a happy face through all situations. Shannon… read more is extremely trustworthy and responsible. She cares about you and others and want to do good to the world. She will never want to disappoint or fail on anyone. These are her most significant features to me. She is a nice girl to have around as she tries to socialize with a lot of people. She likes to have fun, but doesn't drink. I think that is something special to note. She wants to do her work well, so she can be a great addition for any host. She takes great care of the people around her. Shannon you are welcome to come back any time! Good luck on your travels! What a great experience volunteering for Paul! I went there as a guest for 2 nights and stayed for 3 and a half months going from guest to volunteer. Really enjoyed being part of the team and found that Paul focused on the wellbeing of his volunteers as well as that of his guests - all of which contributed to a great atmosphere at the hostel. He… read more was fair in he division of work and stepped right back in to help volunteers when the workload was higher than usual. He clearly loved the rescue animals at the hostel. Always a plus for me. Paul and Dani (Go to her yoga classes!) are honest, kind and compassionate people. Go volunteer for them! We had the pleasure of having Gill with us for a month or two. She dedicates her life to going around the world to spread love and help out wherever she goes. She came to our town and stayed to work at a dog shelter. She decided to work for bóth dog shelters, which was not easy.. , just for the well-being of the dogs. She gave massages and every… read more penny went to the dogs! A true testimony of her amazing character. After she was staying with us for a while we were hoping she could volunteer with us also. She is so reliable and positive! She accepted straight away and commited directly to do all she could for the hostel. Thinking along, improving things, fixing things, helping the guests wherever possible. She really became a support not only at the hostel, but also personally.. What a relief to have someone like her around who you can trust like that. Gill is a smart woman, open and honoust. Véry responsible and a hard worker. I am sure she can do any work, be it anything from management to just hard labour, with ease! She will be a great addition to any place, a supporting colleague and great friend to have. Thank you Gill for everything!! The work was not too hard - I kept the kitchen clean and took care of arriving and leaving guests when Paul was not around. One day a week there was a little bit more to do, on Paul's day off, but never too much. Some days I had to get up early or stay up late but on the other hand some days were practically free for anything I wanted to do. Also Paul is a very flexible and understanding host. I can really recommend this place from my heart. I wish all the best to you guys and send a lot of hugs to gatito Sylvester and the rest of the zoo. Thanks for having me! Kristiina worked at our little hostel for a period of more than 2 months i believe!! It has been great, she has become a friend of us and we are very very sad that she has to leave. In the hostel she has taken care of our guests, received them, said them goodbye, helped them with their bookings or problems that might occur. She has also done some… read more cleaning. Kristiina has a wonderful character. Very cheerful, comforting, interested, intelligent and positive. She has been very very nice to our guests, cares about all people, made them feel at home and stay longer. She has a calm personality, but likes to spend time with others. She is also super nice to have around. She never complains and likes to do her work well. You can tell she is a teacher, because she handles people and children with ease. She will probably do a great job in any condition, from cleaning to teaching to managing and will always be a great addition to the group. I really wish she could stay forever. I will recommend her to any workaway host! It's a gem! Good luck to you Kristiina! Come back whenever you want! We have had Katherine (Kathy) with us for a couple of months (!) and it was wonderful! She offered to take over more work on top of the volunteer responsibilities so she is definitely a hard worker. She has taken care of the hostel alone, helped our guests, did bills and adminstration and cleaning and all to our best satisfaction. All the best to you Kathy!! Thank you very much for everything. Paul y Dani son personas increibles, el lugar es encantador y pude sentirme como en casa. 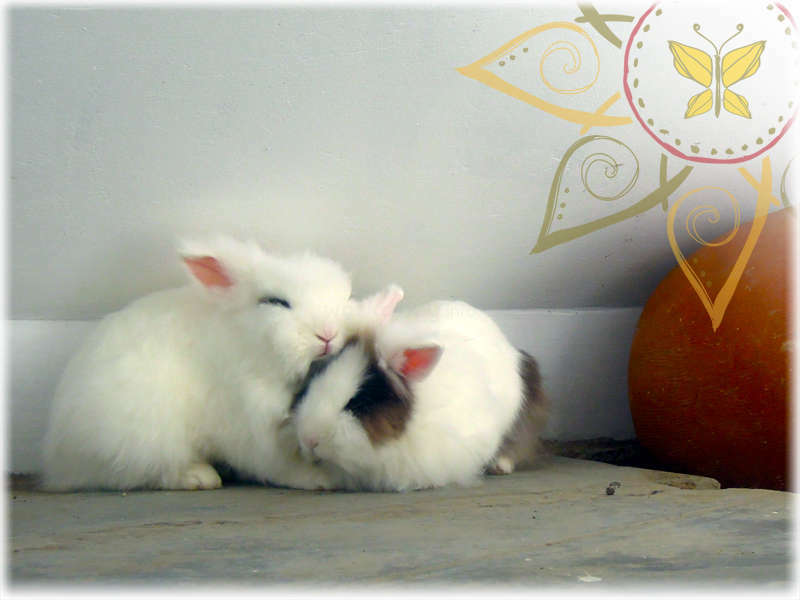 El sonido del mar, la tranquilidad del lugar, la familia de conejos que siemre intentan fugarse, el incomprendido loro Pepe y el adorable Silvester le dieron un toque hermoso a mi estadia en el lugar. Las labores son sencillas y Paul siempre estuvo… read more atento a lo que pudiera necesitar, incluso en momentos donde tenia demasiadas responabilidades su espiritu alegre y amable no decayo. Debby has worked at our little hostel for about two months. She has cleaned the facilities, received guests and did their bills at checkout and provided service to them whenever needed. She had full responsibility over the place at times that i had to leave for a couple of days. Debby is a very special girl. She is always happy and loves to… read more make people feel comfortabel. She is very caring and has a great drive to make the best of everything she does. She never complains, never let her spirit go down and always tries to help wherever she can. That is truly amazing. She is a keen girl that picks up quick what to do and how to. On top of that she is experienced in labouring.. helping me fixing things and thinking along with me to make things better. She wants to do her work perfect and even thinks about more things/project to do on top of daily work. The people in the hostel absolutely adored her. She was receiving new guests with joy and made them feel right at home. She was there when things had to be taken care of..always caring about everyone and truly trying to make best out of everything for everyone. I just don't know what to say more.. She will be loved wherever she goes and will shine a happy light on any place she visits. It doesn't get much better than that. We miss you Debby! Hope you can come back one day. this is a special place, it is absolutely beautiful. Small and quiet, located right on the beach. Has a large outdoor area with hammocks, lovely soft grass and awesome viewing spots for sunset and checking the surf! This is the best place to volunteer! Paul is a great guy and a fantastic host. He really takes care of you, anything you need,… read more he can help you with. He is friendly, easy going and never asks to much of you. A good friend rather than a boss! The work is easy, never stressful and only takes a few hours a day. You always have heaps of time to go for a surf, or just chill and relax the days away! I really enjoyed my time and can not recommend it enough! Seriously, if your lucky enough to get a spot here, you will love it! Thanks so much for having me Paul. I had an epic time here and it was great getting to know you. You are a great host and a good friend, i wish you all the best for the future! Chris has worked at our little hostel for around a month and a half. He has cleaned the facilities, received guests and did their bills and provided service to them whenever needed. He had full responsibility over the place at times that i had to leave for a couple of days. I am very grateful for what he has done and how he has worked. For me… read more the main things are that he is very reliable, takes responsibility, cares about how he does his work and keeps it like that over time, proactive attitude, very helpful, very nice to the guests and an intelligent personality. I can guarantee that these aspects value a lot in volunteer workers and are not easily to be found. I can't recommend him enough because of that and hope to find someone like him again. Contact me if you want more confirmation. Furthermore he is just a nice guy. Calm, interested and kind. Good to have around. Chris I hope you will have a great time on your future travels and adventures. All the best!